00:30:00 Makes 4 servings, 1 cup (250 mL) each. Our poppyseed dressing is the star in this quick pasta salad. 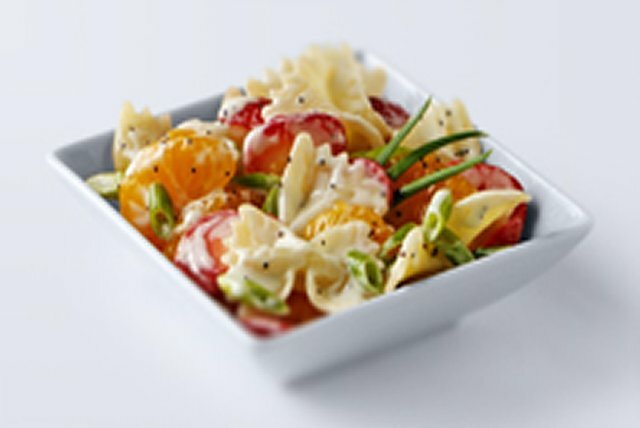 Made with farfalle pasta, strawberries, mandarin oranges and green onions tossed in a creamy dressing, this Strawberry-Orange Pasta Salad is perfect for potlucks, picnics and family get-togethers. Mix Miracle Whip and dressing in medium bowl. Serve immediately. Or cover and refrigerate until ready to serve. Good news!! You'll save 44 calories and 5 g total fat per serving by using Miracle Whip Calorie-Wise Dressing and Kraft Calorie-Wise Creamy Poppyseed Dressing.